Cocoa the Chocolate Fairy was in a hurry. She had just read a sugar fly message from Candy Castle. The note was from Princess Lolli, the ruling fairy princess of Candy Kingdom. Cocoa didn’t waste a second and flew straight to the castle. She hoped everything was all right. It wasn’t every day that she got a sugar fly message from Princess Lolli! When Cocoa arrived at Candy Castle, she was very nervous. 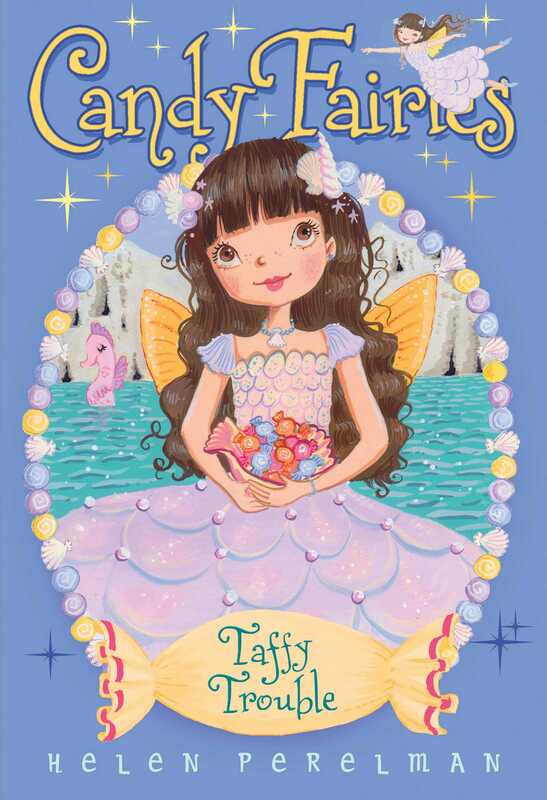 Her Caramel Fairy friend Melli was usually the one to worry. But this time Cocoa’s stomach was fluttering as fast as her wings! The castle guard told Cocoa to go to the throne room. There, Cocoa was happy to see three of her good friends: Raina the Gummy Fairy, Melli the Caramel Fairy, and Dash the Mint Fairy. “Princess Lolli will be with you in one moment,” the guard told them. Cocoa looked at her friends. They all shared the same worried expression. “Is Berry all right?” Cocoa asked. She saw that her Fruit Fairy friend was not in the throne room. Cocoa could tell that Berry was worried something was wrong. Berry was late to everything because she always had to look her best. She usually arrived in a stylish outfit, with matching sparkling fruit chews in her hair. Cocoa saw that Berry had not bothered to change out of her gardening clothes. She had come straight from her work in Fruit Chew Meadow. Cocoa agreed. Something about this meeting made her feel uneasy. “Hello, my sweets,” Princess Lolli said as she entered the room. “Thank you all for coming so quickly.” Her expression changed as she sat down on her throne. “I have gotten sad news from Nillie,” she said. Cocoa gasped. Nillie was the gentle sea horse who watched over the Vanilla Sea. Cocoa and her friends had met the sea horse when they were traveling across the Vanilla Sea to solve the gooey goblin mystery. At first the Candy Fairies had been scared of her. They had all heard stories about the sea monsters in the Vanilla Sea and thought Nillie was one of them. It turned out that Nillie was a kind and beautiful sea horse. Cocoa and her friends had learned that Nillie herself had made up those sea monster stories to keep the waters safe for the animals and creatures living there.